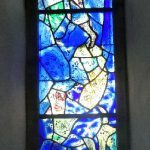 For centuries before the creation of the great city museums and art galleries – the Louvre Museum Paris 1793, National Gallery London 1831, Prado Madrid 1819, people of all classes, from richest to poorest, were daily exposed to some of the most beautiful art in the world. 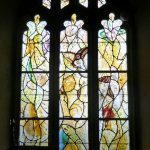 In more recent times, greater importance has been attached to the name of the artist: the William Morris churches of Cumbria. 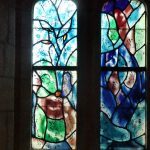 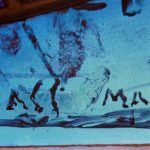 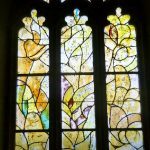 The Matisse windows in the Chapel at Venice; the Tiffany windows in the Brown Memorial Church on Park Avenue New York and, perhaps the most unexpected of all, the Chagall windows in All Souls Church Tudeley East Kent. 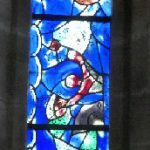 Marc Chagall an east European Jew whose paintings often reflect the mystical folklore of the `Shtetl, was approached by Sir Henry D’Avigdor Goldsmid, a descendant of Elim Henry d’Avigdor, to design a window in the village to commemorate his daughter Sarah Venetia, who had died, in a boating accident, aged 21. 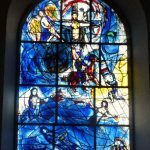 Apparently Sarah Venetia has seen the designs for the Hadassah Memorial Hospital, based on Moses’ blessings on the 12 tribes and Jacob’s blessings on his 12 sons, at an exhibition in Paris. 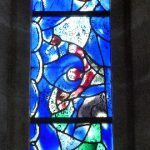 Chagall took the commission and offered to design the remaining 11 windows. 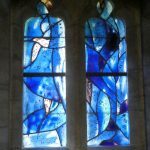 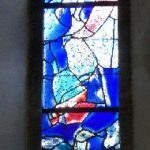 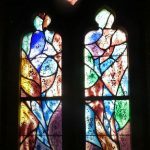 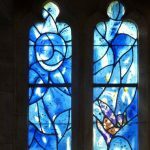 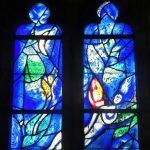 There is a Chagall window in Chichester Cathedral and many more in cathedrals across Europe but, although he often painted pictures of synagogues, apart from the synagogue in the Hadassah Memorial Hospital in Jerusalem, we can find no incidence of his having been commissioned by other Jewish communities across the globe to adorn their places of worship. 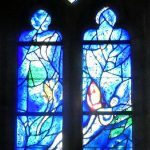 Chagall is buried in a small cemetery in St Paul de Vence, France, it was a non-religious ceremony with a lone person saying Kaddish. 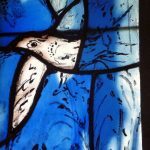 Our thanks to Lynn Saunders for the use of his photos.